Claire is not your everyday practitioner of "urbex," the modern underground passion for "urban exploration" that lures 21st-century adventurers into the hidden labyrinths and decaying chambers of disused buildings and urban spaces. Claire is, you see, a bull terrier. And with her photographer companion, Alice Van Kempen, she has created the canine expression of the art . . . "furbex." 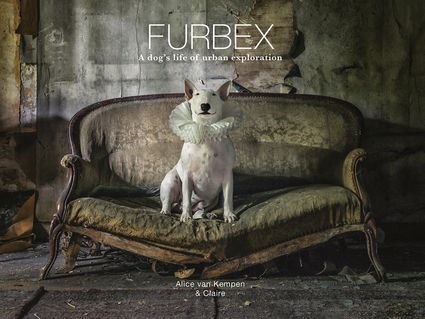 Furbex is a dazzling photographic record of Claire's adventures among the abandoned spaces of Europe. It captures her ghostly presence in ruined hotels and grand houses; crumbling castles and palaces; forgotten theaters and cinemas. Fascinated by shadows and light, past and present, and the mysterious, dark worlds of abandoned places, Alice van Kempen uses thrift shop props and long exposures to create photographs with the air of Old Master paintings; while Claire's tragi-comic presence imbues every image with the pathos and comedy of a silent movie. The result is a haunting and hilarious gift book of unique photographs, which will appeal to urban explorers, dog lovers (most particularly the cult following of the bull terrier breed), and all lovers of the Gothic, the mysterious and the absurd.